This is one ingredient that can enhance almost any dish. Its simple, low-cost and tastes great. I say it is simple, and it is very simple, the key ingredient is patience. I have served them and I am almost always asked, “how did you make these?” or “Mine never turn out this way.” The answer is LOW and SLOW. If you like caramelized onions, I would recommend doubling or tripling the amount you need. Why? because these can keep in the fridge for about a week (or freeze for a few months) and can be added to almost any dish as a topping or mixed in for a quick flavor kick. Plus they are yummy. The following makes about 1/2 – 3/4 of a cup of caramelized onions (same process can be used to make caramelized peppers and mushrooms). Be ready for the onions (and/or peppers) to take about 45 minutes or longer depending on the ratio of onions to pan, type of pan, and heat levels of the stove. Mushrooms are about 10 minutes. In a large skillet (10 -12 in) add oil, onions a pinch of salt and a few turns of the pepper mill. Turn the heat on to Med. Toss to distribute the oil, salt and pepper. Now here is the hard part. Remove the spoon, spatula or tongs and walk away. Remember I said that the key ingredient is patience, this is where patience comes in. The onions, salt, olive oil and pepper will now do what they do best. It will be tempting to fuss with them, tossing, turning, but RESIST. Once you start to see the onions on the bottom starting to turn a little golden, toss/stir. Then walk away again. Wait another 4 – 5 minutes, toss/stir and reduce heat to med-low. You can now stir every 2 – 3 minutes to prevent any burning. The longer you let them sit, the better caramelization will occur as the natural sugars and juices in the onions are released and coat the onion. They are done when they reach a nice rich brown, are wilted (there should not be any crunch left), that once full pan is now 1/4 full or less and there is a nice sheen on the onions and on the bottom of the pan. You can put aside for later or use right away. They re-heat very fast and easily, and are just as great at room temperature, cold or fresh from the pan. Use alone as a topping or as an ingredient to sauces, chicken, pork, burgers, pizzas, potatoes, soups (in fact this is how to prepare the onions if making French Onion Soup), eggs (omelets, Quiche, scrambled, sunny side up, etc), torts, bread, crackers.. Have I left anything out? ahh yes, the kitchen sink. I think you get the idea. Below are some quick simple recipes, use the recipes as guidelines or to spark new ideas. Have fun with this versatile ingredient! 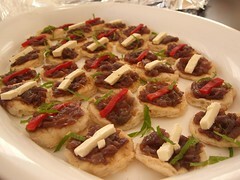 Crostini with crumbled Feta Cheese (Blue Cheese, Gorgonzola, or Goat Cheese) and caramelized onions; Heat oven to 350. Fill a baking sheet with sliced bread (French, Italian, or whatever you have), top with onions then crumbled cheese. Bake for about 5 – 10 minutes until cheese is just soft and warm. Crostini with shaved Parmesan and caramelized onions; prep is same as above, but topped with fresh saved parmesan cheese or what ever you have on hand. Baked Potato with Sour Cream and caramelized onions. You can also add butter to the potato and season with salt and pepper. Salad (spring mix) with goat cheese and caramelized onions and a simple vinaigrette (1 tsp minced garlic, 2 tsp minced shallots, .5 TBS Dijon, 1/4 cup extra virgin olive oil, salt and pepper to taste mix all together). You can also add in any other salad ingredients you like. Thinly sliced pears, apples, grapes, olives also work well with this. Pizza with roasted tomatoes and/or roasted red peppers and caramelized onions; This is a great topping to a frozen cheese pizza or the flat bread or other pre-baked pizza crusts sold in the deli or bakery departments. You can choose to just brush the pizza crust with olive oil, sprinkled with oregano vs using a tomato based sauce. Cheese choice is up to you – Asiago, mozzarella, parmesan, etc.. This same topping combination can also be used for crostini. Pasta with Pesto and caramelized onions; Cook .5 LB pasta according to directions, remove pasta from water and place in a skillet over med heat. Add 1/4 – 1/2 cup of pesto and 1/4 cup caramelized onions. Toss to stir and serve. You can also add caramelized sliced mushrooms. Same process as caramelizing the onions, but less time ~10 minutes. Sausage, caramelized onions & peppers; Cook sausage according to directions, slice and add to a pan with caramelized onions and peppers. Or serve sausage in a bun and top with the onions and peppers. This is where adding a touch of Dijon to the onions and peppers comes in nicely. The peppers can cook in the same pan as the onions. The process and timing are about the same. White sauce (or just added to a standard Bechamel sauce) – Basic quick sauce for Salmon, white fish, chicken, pork or pasta: Saute 2 TBS extra virgin olive oil with 1 large garlic minced, 1 TBS shallots minced and 1/4 cup caramelized onions rough chop for about 2 minutes over med-high heat (best if you can use the same pan you cooked the protein). Add 1 cup white wine (or chicken/vegetable stock) and let reduce by half. Whisk in 1/2 cup heavy cream, 1 TBS fresh oregano (or basil, or rosemary), reduce heat and whisk and reduce slightly until you reach the consistency you want. Taste, add salt and pepper or more cream as needed. If you have tried other combinations or have other ideas, please share. I would love to hear from you. Posted by culinaryease on December 10, 2010 in Cooking for two or less, General Cooking, Parties, Appetizers, and More, Recipes and tagged Caramelization, entertaining, Fast Dinner, Onions. Thanks to Livio for brain storming the ideas in this post with me!